Experience Irish castles, pubs and history from a 300-year-old farmhouse or trail ride to the Cliffs of Moher. Your Irish hosts have carefully restored the 300-year-old farmhouse in County Clare, to accommodate travelers who want to try horse riding holidays in Ireland. Nestled among the rolling Irish countryside, there's a fairytale like setting among the Slieve Aughty Mountains. The farmhouse is decorated with antiques and rural charm, but includes with modern amenities. Forty-five Irish horses await riders for a variety of vacations in this peaceful part of Ireland. On the Galway Clare Burren Trail Ride, you’ll discover Ireland’s beautiful nature and colourful history on horseback. From County Galway horse riding Ireland westwards, trek through the rural areas of County Clare into the unique Burren region and on to the rough Atlantic coast overlooking the spectacular Cliffs of Moher. Riders must be fit and at the intermediate or advanced riding level, as you’ll cover approximately 140 miles over six days, spending four to six hours in the saddle each day. On the Irish Castle & Monastic Ruin Ride, you’ll spend each morning riding in the rural West’s Irish bogs and rolling farmland and afternoons exploring ancient Irish castles and monastic ruins. Riders must be able to walk, trot and enjoy easy canters. On the Residential Ride, experienced riders can go for daily-guided rides, discovering new areas on small tracks, forest lanes and quiet roads. Less experienced riders will be introduced to new skills and can take part in the basic riding tuition in a relaxed atmosphere. Of course every novice rider will also get to enjoy their new equine friend on rides through the lovely countryside. Featured on the Emmy award-winning Equitrekking TV show on Public Television in the Equitrekking Irish Countryside episode. Please see Equitrekking Travel's General Packing List for suggestions. • Helmet- riders can borrow riding helmets for free on this trip. Please let us know if you'd like to do this at the time of your booking. • Guests will need an adapter for Irish plugs to charge their phones etc. Laundry: On the Residential Ride, guests can use the washer, but please note that there is no dryer. When they stay in Lisdoonvarna on the Galway Clare Burern trail (Thur + Fri nights) the hotel offers a laundry service at cost. You’ll find 42 horses, who are all the traditional Irish breeds: Connemara, Irish cob, Irish Hunter and Gypsy Vanner for these horse riding holidays in Ireland. The Irish Horses are known for their stamina and kind, easygoing nature. Your hosts will make sure that you are matched with a mount that suites your riding ability and personality. There are many historic sights in the area, including Irish castles, Monastic settlements, Celtic sites, Burren national park and the Cliffs of Moher. For non-riders: golfing, hiking, cycling, fishing, bird watching and shopping is also available. Residential Ride and Irish Castle & Monastic Ruin Ride- you’ll stay in a 300-year old traditional Irish stone farmhouse, which has been lovingly restored. The farmhouse is in the beautiful Irish countryside. All rooms include a private shower / toilet. Galway Clare Burren trail ride: 4 nights in the comfortable farmhouse, 1 night in Bed & Breakfast in the village of Corofin and 2 nights in 2 star country hotel in the village of Lisdoonvarna. Three meals included each day. You’ll start with dinner on Saturday (arrival day), then daily breakfast, lunch, dinner and finish with breakfast on departure day. (Saturday) In the comfortable dining room, guests enjoy the hearty Irish Breakfast and traditional farmhouse cooking, sitting by the open turf fire. Wine, beer etc. is available at an extra cost. This Ireland horse vacation is ideal for travelers interested in history and Irish culture. It’s comfortable, intimate setting accommodates many solo travelers looking to ride in Ireland. Discover Ireland’s stunning nature and colorful history on horseback. On this progressive horseaback riding vacation, you'll travel about 100 miles from County Galway to the west through the rural areas of County Clare into the unique Burren region and on to the rough Atlantic coast overlooking the spectacular Cliffs of Moher. Contact us to get connected to book now, as these vacations fill up quickly. * Prices may fluctuate based on currency conversions. Please note, the above prices do not include the transfer charge from / to Shannon airport for those not renting a car. The charge is around $43 USD (EUR 35) per person, per way. Riding Ability: Intermediate (strong novice) to Advanced. Riders must be able to walk, trot and canter. Day 1 – pick up transfer from Shannon Airport (if pre booked) to the guesthouse, where you will stay for the first 4 nights. Day 2 - Introduction to your horse and start with the trail along the peaceful slopes of the wooded Slieve Aughty Mountains and across widespread bog lands. Day 3 - Enjoying the fascinating views over the majestic Lough Derg you will be riding by the traditional turf cutting areas, listening to the myths of Neolithic dolmen and learn about the well-preserved ruins on Holy Island. Day 4 - Heading for the top of the hills we will overlook endless woods and miles of storytelling rough old stonewalls sheltering the juicy green pastures. The sandy shores of the Lough Graney invite us to a refreshing ride right across the gentle lapping lake. Day 5 - Lovely wood tracks guide you to the bogy uplands where County Clare unfolds all around you up to the in the distance rising hills of the Burren National Park and the first glimpse of Galway Bay. Overnight in Corofin. Day 7 - Riding further westwards until you reach the edge of the shredded coastline you will be delighted by the breathtaking views of the endless Atlantic Sea, the famous Aran Islands, the rugged Connemara Mountains and the fascinating Cliffs of Moher. Overnight in Lisdoonvarna. Day 8 - After breakfast onwards journey or transfer back to Shannon Airport. * Please note that this itinerary is flexible and subject to changes and revisions based on the weather and other unforeseen circumstances. Enjoy a combination of visiting ancient Irish castles and monastic ruins with lovely guided trail rides through Irish bogs, fields and local farmland on the Irish Castle & Monastic Ruin Riding Vacation. On this 4 days of riding you will visit the impressive Portumna Castle which was the seat of the Earl of Clanricarde and Pallas castle - one of the best preserved tower houses and castle grounds of the 14th century. You will also take a boat ride to Holy Island on the river Shannon to explore the ruins of one of Ireland’s most important monastic settlements, and ride to a 5000 year old Celtic tomb. Prices are per person and include 5 nights accommodation with all meals, 4 days guided horse riding and all entry fees. * Prices may fluctuate based on currency conversions. Please note, the above prices do not include the transfer charge from / to Shannon airport for those not renting a car. The charge is around $43 USD (EUR 35) per person, per way. We can also arrange 4 day / 5 night trail rides on request. This riding vacation is great for those who want to combine horseback riding with area historic sightseeing. Mornings are spent riding and each afternoon, you tour a historic site, including area castles and monasteries. Day 1 - Saturday - Arrival in Shannon Airport and transfer (if booked) to our An Sibin Riding Centre. Transfer from Shannon to Whitegate approx. two hours. You will be staying here for 5 nights. On the arrival day you can just relax and recover from your journey, or take a stroll on the well sign-posted nearby walking trails. In the evening, you will get to know all your fellow riders for this week. You will have dinner in the tastefully restored 300 year old farmhouse in the An Sibin Riding Centre by candlelight and open turf fire. Back to the riding centre for a delicious dinner. Day 3 – Monday – On today’s ride (2 and 1⁄2 hours) you will ride into the hills of the Slieve Aughty Mountains and enjoy fascinating views over the majestic River Shannon. In the afternoon you will get to visit the Portumna workhouse museum, where the poor and destitute took shelter many years ago during the famine times. You will also visit the impressive Portumna Castle of the 17th century with it’s beautifully restored walled garden. The 4th Earl of Clanricade built this Renaissance castle and lived a lavish life here. You will also have time for shopping in the town or enjoy another Irish pub. Relax by the peat fire and a traditional home cooked dinner back at the riding centre. Day 4 – Tuesday - This morning’s ride (2 and 1⁄2 hours) will take you on quiet tracks through Ireland’s beautiful rural countryside. This afternoon’s visit will bring you to the ruins of Pallas castle, one of the best preserved tower-houses and walled castle grounds of the Irish gentry in the 14th century. In the evening you will enjoy your dinner again at the riding centre. Day 5 - Wednesday - Today is a full day ride. The 2 hour morning ride brings us across the magical landscape of bog and heather. We will have our lunch picnic out on the trail, where we meet our minibus with all the supplies for horses & riders. On the 2 hour afternoon ride we will pass by a typical Celtic dolmen, which is believed to be 5000 years old! The ride will finish on a field where the horses are happily turned out. Tonight is the final dinner in the comfy atmosphere of the riding centre. Day 6 – Thursday - After breakfast it is time to say “slan abhaile” and to get ready for the transfer (if booked) back to Shannon. 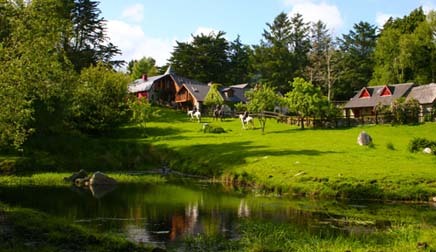 Live the dream of your own horse for the week in Ireland, staying at a lovely remote site surrounded by woods and bog land with endless riding tracks. You will be relaxing in a tastefully restored 300 year old farmhouse with ensuite rooms on this Irleand riding vacation. As a more experienced rider, you can take your horse out for a different ride every day with a guide. As a novice rider you can gain more knowledge about your new four-legged friend in the daily horsemanship lessons, take part in the basic riding tuition; and of course enjoy the Irish countryside on guided rides. Saturday is the arrival and departure day. We offer the residential riding vacation from early April to late October. Price includes your holiday horse for 6 days, (15 hrs riding or basic lessons) and 7 nights en suite accommodation in a farmhouse with full Irish breakfast, tasty lunch and dinner. This is a great riding vacation for beginner and experienced riders alike in the heart of the Irish nature in rural West Ireland! You’ll start your Ireland equestrian vacation at the Riding Centre and farmhouse in the rolling hills of the Slieve Aughty Mountains, where miles and miles of riding trails abound. The 300 year-old lovingly restored farmhouse is just a few miles from the small village of Mountshannon with its unique monastic settlement on the Holy Island in Lough Derg. The surrounding area is comprised of heather covered bogland, woodland and lush green fields dotted with old stonewalls. Many people in the area own horses. The picturesque river Shannon can be viewed on many area rides. There are lots of beautiful and ancient places to discover on horseback day after day. From the remnants of the poteen makers cottage to stately manor houses with their fine walled gardens; the Killeens (ancient cemeteries) and the perfect example of an Oratory in Clonrush graveyard. Even the dolmans, Celtic burial sites, can be visited on horseback. A picnic by the gently lapping shores of the Lough Derg is an enjoyable break for rider and horse alike. The experienced rider can go for daily-guided rides, discovering new areas on small tracks, forest lanes and quiet roads. Less experienced riders will be introduced to new skills and can take part in the basic riding tuition in a relaxed atmosphere. Of course every novice rider will also get to enjoy his or her new equine friend on rides through the lovely Irish countryside. Guests stay in individually decorated ensuite rooms and may relax in the cozy ambiance of the sitting room. A hearty Irish breakfast, lunches and the traditional home cooked dinners are enjoyed in front of the open turf fire in the dining areas. The downstairs dining room is a nice gathering place. The farmhouse is decorated with antiques and artifacts collected by the owners. Realize the dream of your own horse for the week at this equestrian centre situated on a lovely remote site surrounded by woods and bog land with endless riding tracks. The Ballinasloe Horse Fair is one of Europe's oldest and largest Horse Fairs, dating back to the 18th century. Combine horse riding in thebeautiful Irish countryside with a trip to this horse fair! This includes 5 nights at An Sibin, all mentioned meals, transports, admission fees and guided horse riding. Please mind there is no lunch included on Sunday! Non-rider price: $753 USD* (EUR 660) per person sharing. Through your extensive knowledge of both horse and trail we were able to confidently navigate, at all gaits, the often challenging rides through bogs, across lakes, through mountain forests and over the hauntingly beautiful terrain of the Burren. We not only witnessed the beauty of the Western Irish landscape, we were truly part of it. - Thank you so much for an absolutely extraordinary Ireland riding vacation trip. As horse owners and enthusiasts we were especially pleased to see how well your horses are cared for and the priority given to their health and well being. I took a great risk taking my whole family (4 children and husband) with me on the Burren trail, but the trip was so wonderful, Nicola and Bertie very nice and the horses just gorgeous and adapted to the experience of any of us that I cried when the trip was finished... Thank you again for this wonderful experience. Thank you for a tremendous and terrific week of riding! We are telling all our friends to put this on their must do list for vacations! Thank you so much for the wonderful riding experience and vacation. I loved your facility - the accommodations were great, the horses super + everyone was so friendly and gracious. The whole week was very well organized and it exceeded all my expectations. Your staff was wonderful! I will always have a soft spot in my heart for Ireland - thanks to you! I'm still thinking of my trip to Ireland and the incredibly wonderful adventure you took me on! Has to be one of the best vacations ever! This was one of my dreams and you did a fabulous job to make it very special! I want to thank you for a wonderful trip through County Clare on horseback. Your horses were wonderful, your saddles were very comfortable or I would not have lasted six days on the trail! The guides who helped us with the horses were a fantastic group. Of all the trips I have taken (one a year since 1981) yours was the most organized. It was a pleasure the entire time we were with you. I will recommend you to all my friends. I wanted to thank you both for making my trip a good experience and one that although challenging was rewarding. I applaud your choice of Nina for my mount, as she really was perfect for me. In the 6 days of riding, she never put a foot out of place and helped me boost my confidence. I saw your country in the way of the people, not the touristy things that we all do and think we have seen something of the country. Your graciousness, professionalism, and genuine love of the horses will long be remembered. I have never had a more caring host, and have to say how well run I think your organization is. My compliments to your cook - she is a gem. Again, thank you for a wonderful holiday. Is there no place in the world I can get some peace and quiet?" YES!! From the enchanted, beauty of the countryside to the energetic and fun loving guides, to the great food and comfortable living quarters, I can not pick one thing I loved best about my stay! Put this trip on your 'bucket list' if you have any spirit of renaissance and love for planet earth! You have a beautiful home in a gorgeous area. Our horses were wonderful as were the guides and the food. We just couldn’t have asked for more. Thank you again. Our vacation was one I will never forget. It is all because each and every one of you put so much thought and caring into every aspect. The smallest detail was the most precious. Thank you very much for the wonderful stay, beautiful rides and not to forget – the very, very good meals. Thank you for the wonderful trip and experience I had with you, your horses and your country. The land, the people, and the music of your country truly fills my heart and soul. Joanne Filkins recently returned from an equestrian vacation in Ireland, which she won in the EquitrekkingTravel.com Ireland riding vacation contest. Here's her review of her ride. We got back from our trip on Saturday night and it was great! Thank you so much to you and everybody at Equitrekking for giving me such a wonderful prize! We would recommend the Galway ride to anybody who is interested in riding in Ireland. Although Sharon and Janice are both very experienced riders who own their own horses and I only started riding a few years ago as an adult, we all enjoyed the riding and felt that our horses were well matched to us. We chose this time of year to accommodate our schedules and it turned out to be ideal — not too cool or warm and ahead of the main tourist season so none of the places that we visited were too crowded. All of us were very happy with our horses and the people, food and accommodations were all great! Nicola and Bertie have done such a terrific job of renovating the house and including so many fascinating little details such as horse related pictures, decorative antiques, and a lovely garden. We were also pleased to see how well they take care of their horses and other animals. The donkeys, dogs, and unusually colorful chickens were all very entertaining! The residential ride was perfect for us because it allowed us to do some sightseeing in the area. We visited several castles, some restored and furnished with antiques and other in ruins. A couple of them had beautiful walled gardens too, and at Bunratty Castle we saw the folk park, which is a village of furnished examples of 19th century houses, and shops plus some farm animals, and attended a medieval banquet which included singers, a harpist, and a bagpiper, all in period costumes. Closer to An Sibin, we enjoyed a boat trip to Holy Island with a wonderful local guide and saw several other ruined churches and abbeys too. We were glad that we arrived a day early before the ride began because that allowed us to see the Cliff of Moher, the Burren, a Birds of Prey demonstration, and a great concert of Irish music and dance performed by kids aged 10-19 as part of a music festival in Ennis. All in all it was a wonderful trip and I was so pleased and surprised to have won it! Updated annually, Fodor’s Ireland provides the most accurate and up-to-date information available in a guidebook. Amazon.com Review-- You'd be hard-pressed to find a more comprehensive, engrossing and just plain fun-to-read guidebook than the Eyewitness Travel Guide: Ireland. Spilling over with all sorts of useful information for the traveler, you'll find three-dimensional drawings, floor plans, detailed neighborhood maps with a street-finder index, and even historical timelines. Publisher’s Weekly-- First published in the U.K. and shortlisted for Irish Novel of the Year, this brooding new historical fiction by novelist, playwright and critic O'Connor (Cowboys and Indians) chronicles the mayhem aboard Star of the Sea, a leaky old sailing ship crossing from Ireland to New York during the bitter winter of 1847, its steerage crammed to the bulkheads with diseased and starving refugees from the Irish potato famine. Amazon.com Review-- In this delightful and illuminating look into a crucial but little-known "hinge" of history, Thomas Cahill takes us to the "island of saints and scholars," the Ireland of St. Patrick and the Book of Kells. Since its first publication in 1994 Richard Killeen's Short History of Ireland has been widely accepted as the most accessible introduction to Irish history. It presents the history of Ireland in attractive double paged spreads, which can be quickly read to give an easy overview of the key events of Irish history. It is superbly illustrated with over 150 full color photographs, paintings and drawings. Publisher’s Weekly-- A research fellow in history at De Montfort University Leicester (U.K.), Cronin offers synopsis with little insight in this overview of Irish history. Publisher’s Weekly-- In what PW described as an "engaging revisionist chronicle," the author traces Irish history from 1600, when the country had a subsistence economy and was home to a welter of peoples, each of whom defined their "Irishness" differently, to the 1970s, when Ireland--despite three centuries of conquest and fissure--was a country with a powerful identity. Galway- Clare- Burren Trail Ride / Irish Castle & Monastic Ruin Ride Intermediate (strong novice) to Advanced. Riders must be able to walk, trot and canter. See "Itineraries" tabs above for rates and dates for various Ireland vacation packages. Ask us about group discounts! English all-round saddles with comfortable, deep seats and good knee rolls. Only a few western saddles are available – they have to be requested in advanced. Shannon airport (1hr and 20min drive. Transfers available.) A rental car is not needed for the Galway Clare Buren trail ride or the Irish Castle & Monastic Ruin ride, but is recommended for the Residential Ride.